Food that burns inside of a cooking pot leaves a stuck-on residue and unpleasant odors on the bottom and side of the pot. The smell from the burnt food lingers on the pot, even after the actual food is successfully removed. Liquid or powder dish detergents are not strong enough to deal with such bad smells. 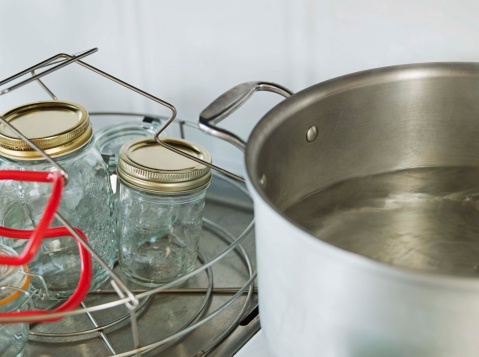 A trio of household items absorb and lift the burnt smell from the pot, allowing you to again use the cookware. Dampen the pot with tap water. Don't dry the pot as you need it wet for the next Step. Sprinkle 1 to 2 tbsp. of table salt into the pot. Spread the salt throughout the inside of the pot with your fingers. Leave the salt on the pot for about 10 minutes so it can absorb the burnt smell. Scrub the pot with a dampened scrubber or sponge. Then, rinse the salt from the pot with water. Do not dry the pot. Sprinkle 1 to 2 tbsp. of baking soda into the pot. Spread the baking soda around the pot with your fingers. Pour 1 to 2 cups of white vinegar into the pot. The resulting chemical reactions lifts any leftover burnt smell from the pot. Wait until the chemical reaction subsides. Then, scrub the entire pot with a dampened scrubber or sponge to spread the baking soda and vinegar mixture. Leave the solution on the pot for 10 minutes. Empty the pot and rinse it thoroughly with water.